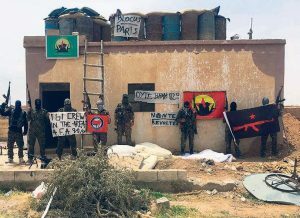 According to a report of Greek daily Eleftheros Typos, anarchists from different countries have flocked to Rojava, they receive training to fight the jihadists of ISIS, but also to implement the guerilla warfare in their own countries. 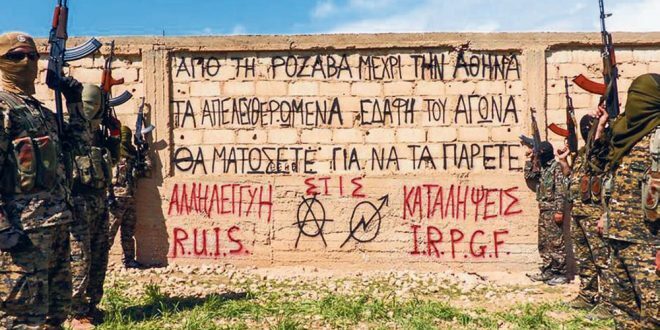 Greek authorities have been informed in the past about the presence of the Greek anarchists there, however, recently there has been an “intense activity” by members of a group called “The Revolutionary Association of Internationalist Solidarity” (RUIS) that has been set up by Greek anarchists. Pictures obtained by the Greek daily, show fighters wearing uniforms and hoods and holding weapons while they stand in front of a wall with a slogan written in Greek. The pictures have been posted on internet by the IRPGF, the daily notes. 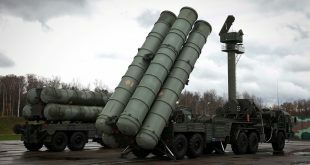 The movements of Greeks in Rojava have prompted the interest of the relevant security services. This is because in texts of anarchists who fight there, it is suggested that “warriors will be trained in guerrilla warfare and then will be able to apply what they learned in their homelands.” Eleftheros Typos reports. 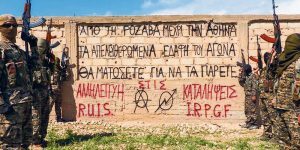 A video posted on an anti-authoritarian website in 2015 had shown a Greek anarchist as warrior sending a greeting to Kurdish and other fighters in Greek. 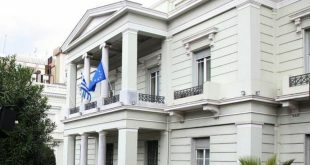 Competence sources told Eleftheros Typos that authorities are aware of the phenomenon which have been following and try to get a better picture. It should be noted that it is not the first time anarchists move abroad to learn warfare. Many international agencies refer to Rojava as “anarchist land” because information given about the region in wikipedia speaks of ‘direct democracy there. The region gained its de facto autonomy in 2013 as part of the ongoing Rojava conflict and the wider Syrian Civil War, establishing and gradually expanding a secular policy based on the democratic confederalism principles of democratic socialism, gender equality, and sustainability. Rojava is regarded by Kurdish nationalists as one of the four parts of Greater Kurdistan, which also includes parts of southeastern Turkey (Northern Kurdistan), northern Iraq (Southern Kurdistan), and northwestern Iran (Eastern Kurdistan). 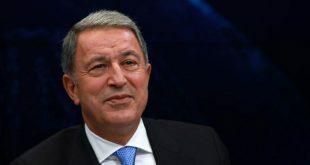 However, Rojava is home to sizable ethnic Kurdish, Arab, Assyrian and Turkmen populations, with smaller communities of ethnic Armenians, Circassians and Chechens. Full article of Eleftheros Typos “We export anarchists to Kurdistan“.